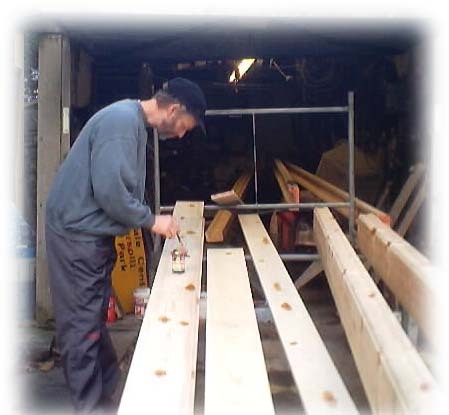 Once the timber is sourced it is taken to our workshops and prepared before arriving on site. 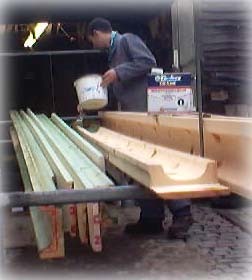 Here you can see the Knotting being applied in the second stage of preparation. After the Knotting we use Dulux Weathershield preservative primer. Here you can see the green hue to the wood. After that the undercoat and gloss coats will be applied. At no stage is bitumen ever used. Once fitted with galvanised nails the spout will only require cleaning out as local conditions demand. In this way the original spout will preserve the look of your property and will last for many years. Do not be fooled by Plastic and aluminium spouts They all need clearing out of leaves etc.